​Which type of wearable user are you? Wearable tech has opened up the depths of our understanding into our fitness, health and personalities like never before. From fitness trackers to brain monitors, we’re constantly collating incredibly personal data, which really makes this new breed tech the most personal ever...right? Wrong. 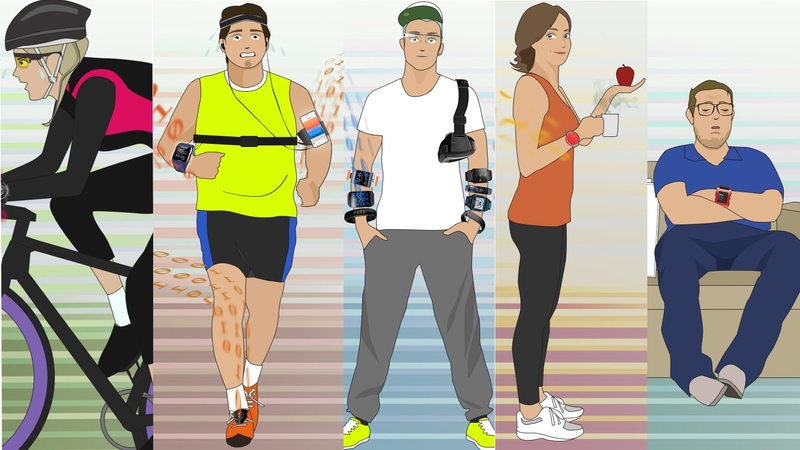 In fact, there are only five types of wearable user, and we’ve discovered them all. Using advanced science that involved sitting in the pub and talking incomprehensibly, we’ve come up with this selection of wearers, which we can all identify with. So without further ado, here are the five types of wearable user. Let us know which one applies to you in the comments, or if you think we missed you out. The beginner runner is starting out on his fitness adventure, and hats off to him for getting started. However, this aspiring athlete is strapped to the nines with fitness tech, most of it only suitable for elite runners. With a watch monitoring his VO2 Max, chest straps for vertical oscillation, foot pods for cadence and headphones for heart rate, this guy’s producing more data than the entire Tour De France peloton – and he only popped out for two miles around the local park. This lady is making all the right choices thanks to her beloved fitness tracker, which may be starting to take over her life. She had 8.2 hours sleep last night at 105% of her daily target, and just upped her step goal to 12,000 per day. The apple added 38 calories to her registered intake, and that’s her second coffee of the day. It’s all logged for perusal later, and she’s praying she makes the grade. Completing a triathlon before the rest of us have woken from our slumber, the Ironwoman is a 21st century fitness hero. Only the most extreme sports watches apply for the Ironwoman, who needs the Garmin Fenix 2’s 50 hours of GPS tracking just to cover her weekend training ritual, and will spend the rest of the week pouring over minute details of her cadence to snare that elusive PB. The male species can also be spotted in the wild by his distinctive lycra leggings. He’s got six Samsung smartwatches on his wrist, plus a couple of ropey fitness trackers; Google Glass which he signed up for straight after I/O in 2012, and an Oculus Rift developer kit at home. The early adopter has more money than sense, and is always on the lookout for the next cutting edge device. Did he tell you about his first-gen Fitbit Force? Yes, the scabs should clear after the third skin graft. This wearable animal kickstarted 25 new gadgets in 2014 and hasn’t received a single one. His brain wave emotion tracker is permanently delayed, his smart ring is on its 40th stretch goal and the creators of the connected toilet have stopped replying to email. He’s especially proud of his original Pebble, which is definitely the best smartwatch out there – “the battery life is just great,” he says. Oh well, just five more months until those smart insoles start shipping.